In May 2017, President Abdel-Fattah El Sisi ratified a restrictive new law on nongovernmental organizations. Starting from its passage in parliament in late 2016 and continuing over the past year since its signing, the legislation has met fierce resistance from the human rights and international community, including from foreign allies like the United States and Germany. Its opponents pointed to serious impediments to registration and operation, potential for increased governmental surveillance, and the secretive nature in which the bill was rushed through the parliament. The law codified repressive tactics that had been used to target civil society actors for years prior, enshrining them for years to come. Bureaucratic hurdles presented serious obstacles to registration; human rights defenders were targeted for their work and faced asset freezes, travel bans, and prison sentences (as with the infamous Case 173); the criminalization and blockage of foreign funding strangled the work of many others; harassment and fear became normalized. But, as new research from the Civil Society Research Group at American University in Cairo shows, the impact of the crackdown extends even more broadly. The restrictions affect those working on a broad range of issues, including those that seem in line with the state’s own declared policies, and in all areas of the country. Led by Amy Austin Holmes, Associate Professor of Sociology at the American University in Cairo and fellow at the Woodrow Wilson International Center for Scholars, the team of leading civil society experts conducted interviews with a wide variety of civil society actors throughout Egypt, highlighting the diversity of civil society in the country, the various mechanisms of repression used to curtail anything from labor movements to local anti-FGM campaigns, the strategies different actors use to survive, and the implications for the future. 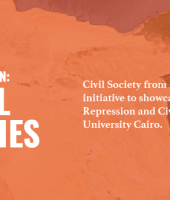 The Tahrir Institute for Middle East Policy is excited to provide a platform for this original research in a series entitled “Civil Society From Alexandria to Aswan: Survival Strategies,” in keeping with our mission to bring local, especially marginalized, voices to policy discussions, and to advocate for policy solutions based on sound research findings. We present the team’s original research with an introductory article from Holmes and an initial paper on women’s groups. Further research will be published on worker’s civil society, Christian organizations, Nubian activism, and legacies of terrorism and tribalism in Upper Egypt. All materials will be made available in both English and Arabic. The views in these articles reflect those of the author, and not those of AUC.